This late 19th century landmark adjacent to the statehouse was due for a full cleaning and repointing of its granite facade. Miscellaneous repairs over time had begun to act adversely with the stone’s original lime mortar. The building was fully cleaned of a century’s accumulated grime. Several different grout joints had been used around the building to accentuate its cut and rusticated stone elements. All of these masonry joints were repointed with traditional lime based mortar materials and application technique. Some key interior spaces were also restored to more closely resemble their original state. The Map Room had been carved up with offices, its mosaic floors completely covered with carpet, and its translucent glass barrel vault had been painted when the its skylight was roofed over. 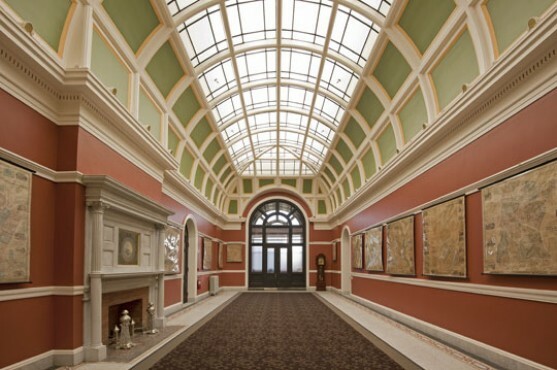 This space was again opened up as a display gallery and the inner dome restored with artificial back lighting to simulate the effect of the original skylight. A similar treatment was executed in both the genealogy and reading rooms with their respective circular dome and coffered ceilings restored. This also allowed for removal of the “flying saucer” lights that had been introduced to compensate for the original skylights. New paint and finishes completed the restoration.